They may have missed out on the skyscraper boom in their home country of Britain but Grimshaw Architects has designed a cleverly leaning skyscraper for the Australian city of Sydney, that if it gets built will be well over 200 metres tall. Proposals have been put forward for a new residential tower for the Australian city of Melbourne. To be located on a corner plot at 450 Elizabeth Street in the heart of the city centre the tower will, if approved, be a quite respectable 192 metres in height. The latest design from Rogers, Stirk, Harbour & Partners is C4, a 185 metre tall tower planned for the Australian city of Sydney that definitely has nothing to do with explosives, and instead refers to the plot number it would stand on. Proposals have been put forward for a new tower to occupy 58 Clarke Street on Melbourne's Southbank. Proposals have been put forward for a new skyscraper to take pride of place overlooking Collins Street that lies in the heart of Melbourne's central business district. Soon to be rising in the Australian city of Brisbane is the Infinity Tower, an approved 236 metre tall skyscraper that will rise 73 floors in height. Australian surfer's paradise, the Gold Coast, is set to add to its ever growing skyscraper cluster with a new tower that looks like it could be sponsored by Nike although it isn't. A controversial new skyscraper proposed for the Australian city of Melbourne is to go to appeal after the local planning authorities initially turned it down. When the light points in the right direction a face sometimes emerges on the surface of Mars, soon the same could be happening in the Australian city of Melbourne if a unique new tower gets the go-ahead. 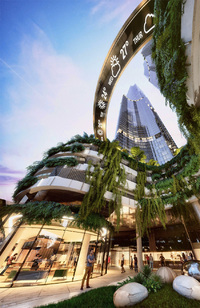 After a genesis of seven years work is finally moving forward on Grocon's latest skyscraper to stand in the Australian city of Sydney on the site of the former John Boyd Tower following the completion of an $800 million Australian financing agreement and pre-lets. Australia's Gold Coast is set to get another skyscraper to add to the rapidly growing collection of tall buildings there with the beginning of construction on a new 243 metre tall tower.